It’s definitely not thought of as one of the sexiest things about publishing, but metadata is hugely important. Being accurate and complete with your metadata could mean the difference between your book being found or lost in the crowd. Metadata describes your book in order for other people or information systems to understand what it is about, and ensure that it comes up in the correct categories and searches. At it’s most basic level, it should include the title of your book, the author name, the publisher and the ISBN. 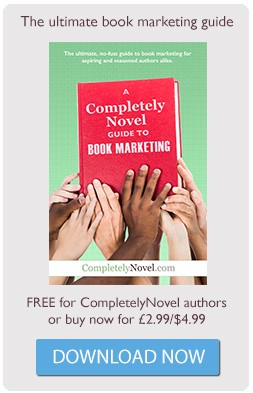 Most publishers will also give you the option to select categories and tags for your book. Take time to select the categories that are right for your book. This will influence where it appears within websites or bookshops, and sometimes whether it comes up in recommendation lists alongside other ‘similar’ books. A book’s metadata should also include the book description or blurb – and this is surprisingly often overlooked by self-publishers. If you are writing a non-fiction book, you will want to put plenty of keywords in your description. By keywords, we mean words which have the most value relative to all the others, i.e the ones that you anticipate your target audience will be searching for online. If you are writing a fiction book, then it’s slightly harder to identify keywords, but try and include things like the genre, similar authors and similar books. Of course, the description also needs to make sense, so don’t go too keyword-crazy! There’s some advice on choosing keywords over on the PBS self-publishing blog. 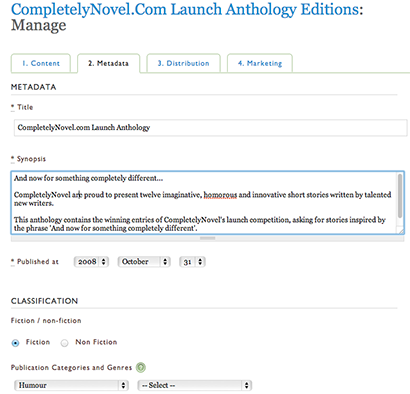 On CompletelyNovel, there is a section where you can fill in all your metadata for each book that you create. We recommend that anyone who publishes with us takes the time to go through this carefully, as your book will then be easier to find on our website and will display more prominently in search engines. If you’re taking advantage of our Plus or Pro plans then it’s even more important, as this information can then determine where you book charts in bookseller searches. You should double-check that all your is correct before you submit your book to be sold by other retailers. We’ve got some advice on proofreading which can help you check for typos or missing words. As soon as you send your book to retailers, all of this information will be out in the open, so you don’t want there to be any mistakes. How can metadata help me as an author?